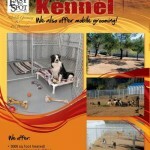 Our 5 acre Pet Boarding facility is located in Acton, CA. Our 3000 square foot building is fully heated and air conditioned. 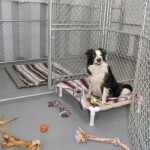 Each pet has a separate 6 x 12 run inside with a comfortable bed with blankets and water available at all times… inside and in the exercise yards. 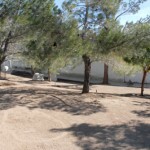 We have 22 spacious exercise yards that are shaded and have a view to all of our barnyard critters!! It’s fun to see the different reactions that the dogs have to the sheep, donkey’s, horses, cows and even the pigs. The dogs are never allowed to be in with the barnyard animals but are allowed to see and sniff them thru the fence. The barnyard critters seem to enjoy the company and attention of the dogs too!! We have exercise times for the pups 4-5 times a day depending on weather. We do not practice “dog park” exercise times….. Each dog gets it’s own yard or can share a yard with housemates. It is really wonderful to see the pups running and exploring on the ranch!! They all seem to get PLENTY of exercise. Most owners report that they pretty much do lots of sleeping upon their return home.